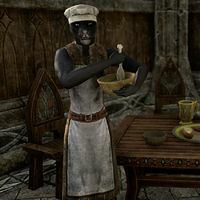 Hizala is a Khajiit chef who can be found in the Salted Wings Tavern in Vulkhel Guard. When you speak to her, she says, "You are needing a good meal, yes? Everything I serve is sugar-sweet and ready to eat!"